A “quipu”, was a method used by the Incas and other ancient Andean cultures to keep records and communicate information. In the ancient Quechua language of the Andes, “quipu” means “knot”. A Quipu is in fact a set of knotted loops, tied by a thicker rope supporting them. 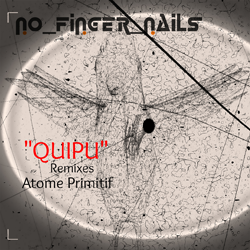 Quipu is also a project created by Atome Primitf, a collective of musicians and "dreamers" from Europe, a project inspired by that same method of knots, stringing artistic ties and new collaborations, through cross-genre musical interpretations and audio-visual concepts. In fact Quipu was born as an audio-visual concept. The four tracks of the EP started as original compositions of Atome Primitif, with the elements of voice, violin and acoustic guitar modeling an unplugged sound. Quipu traveled all around Europe, involving artists from different countries, each one adding their own personal knot, inspired by the compositions of Clelia Patrono. 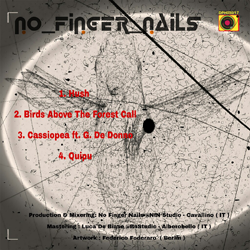 Andrea Presicce aka No Finger Nails adds his own musical knot through his musical experience, ranging from Electronica to Dub. The EP consists of four remixed tracks, offering a very dub-ambient and mystical alternative, using the original organic sounds. The project expands also audio-visually, with videos and visuals being produced, on that same quipu idea. Dubophonic is very proud and honored to be part of this, tying its own knot in this continuously evolving project! Awarded with 4 stars "Album of the month" by CCtrax & Quipu awarded "excellent track"